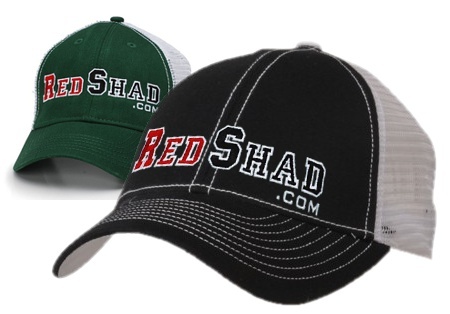 Show your RedShad.com colors with this high quality, 6-panel cap. Simple old school style is delivered in this two-tone structured trucker cap of green or black cotton with striking white mesh. Low in profile with a flattering slim round shape, the crown is classically constructed out of 6 panels: 4 panels of white colored polyester mesh at the sides and back and 2 panels of durable and attractive green or black cotton twill at the front of the crown. The back of the hat is finished with an adjustable hook and loop strap for a secure fit.